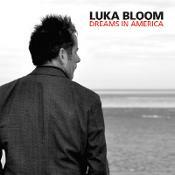 Luka Bloom is back with a stunning new album DREAMS IN AMERICA. An Internationally acclaimed singer-songwriter, and recording artist; Luka Bloom has enjoyed twenty years of success worldwide. Since the release of one of the all time Irish classics 'Riverside' recorded in 1990, people from all corners of the globe have embraced the true beauty of this remarkable musician. He has a catalog of quality recordings that would make any budding songwriter aspire to. To celebrate these twenty years, Luka has carefully chosen and re-recorded some of his stunning repertoire. These songs represent a fascinating journey, from when he immigrated to America in the late eighties, to the present day. Here's Luka himself on the new record: "I'm allergic to nostalgia. Long nights reminiscing about the good old days are a bit of a yawn to me. Much more excited by the good now days, the next song, the next gig, the seed of the next record.... And yet, perhaps it's ok to press the pause button for a moment, and reflect a tiny bit on experiences over a period of time. Not dwell too long; just feel it again, pay respect to the places and the people." This is what DREAMS IN AMERICA is about, a raw, honest reflection on the songs of the last 20 years. On his ability as a performer Luka Bloom has received phenomenal praise, which has resulted in sell-out shows worldwide. This is a testament to a real troubadour who has worked and developed over many years into a true master of live performance. The combination of his melodic thought provoking material, along with his incredible skill in reading and connecting with his audience makes this praise worthy. "…someone whose quest is far from over, but whose comfort in his own skin bears testament to a road well travelled. And the music's not half-bad either. Magnificent." "Bloom never fails to deliver an entertaining show, and you are hereby advised to catch him at a town near you". Der irische Singer/Songwriter Luka Bloom hat sich mit Alben wie "Riverside", "The Acoustic Motorbike", "Between The Mountain And The Moon" und zuletzt "Innocence" und "Eleven Songs" kontinuierlich eine große und treue Fangemeinde erspielt. Seine Karriere startete vor mehr als 20 Jahren, als er beschloss, sich von Kildare/Irland an die amerikanische Ostküste aufzumachen, um seine Songs dort zu präsentieren. "I was running out of the road on the island. And I felt something in the sound I was making, that drove me to believe …." Nach einer Reihe von erfolgreichen Konzerten in angesagten Clubs in Washington DC, Boston und New York bekam er einen Deal als erster irischer Künstler nach Van Morrison bei Warner Brothers … und öffnete damit die Märkte in seiner Heimat Europa. Er zog von Dublin nach New York und bereiste von dort die Welt. "Those days in New York changed everything. They opened the door to the world. It still amazes me."